Almost one of the nicest day walks I can remember without being in the mountains or more traditional wild walking country, the only drawback being the amount of forest walking involved which did become slightly tedious particularly as we dislike long forest walks anyway. The day started badly, we arrived at Leatherhead to discover that the Guildford train had been cancelled, so we quickly decided to do the stage in reverse catching the train to Boxhill (due in several minutes) and walking to Guildford. This proved very interesting as on more than one occasion the signposting only seemed to cater for West to East with plenty of signage at the point we left a path but very little at the point we started, luckily we followed the map. It is late January so hardly surprising that the weather forecast warned of a cold day, we wrapped up well, too well, the hat and gloves soon going back into our packs but just to reassure the Met Office it was slightly chillier than the previous week. 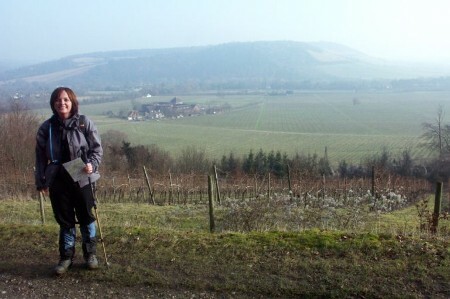 The first few miles were really pleasant walking with nice views across vineyards, yes we are in England not France or Italy, maybe later in the year we should try the wine? The vineyards were followed by really pleasant heath and downland with views over to the distant South Downs before the path headed into old beech woods. The woods were quite interesting at first, particularly from a historical perspective, as the area had been the site of a Second World War security network of bunkers and gun emplacements, very thought provoking to think of the number of soldiers that must have been camped out on the Downs looking after London to the south. We also ran into a 'hunt', or more accurately a hunt ran into us, the woods were full of horses and dogs, hopefully not hunting - as this is now banned - just out for a Saturday gallop, wonder what you call a hunt now they are not hunting? Once again the Surrey country friendliness came out to the fore with a very chatty but loud hunt master then the riders, all of whom made sure we were safe as they went past followed by a couple of runners who extolled the benefits of having had an extra mince pie before setting off. It was actually quite a sight made better for the fact that they were not intent on chasing anything to its death and just goes to show that the old traditions can continue even if slightly amended. 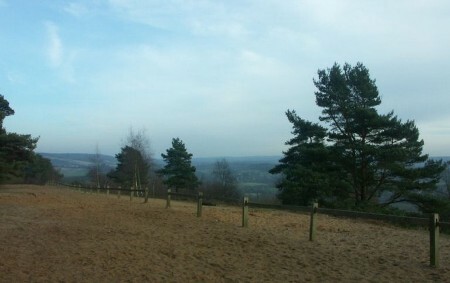 The trek through the woods then started to tire and drag on a little bit too much and the feeling that this is one of the nicest day walks waned, we were relieved to arrive at Newlands Corner picnic spot for chips and tea. Only a few miles left to go into Guildford but quite an exhilarating walk uphill - in the sand - to St. Martha's Church and another glorious viewpoint before heading back down and along the River Wey to the station. If it had not been for the overlong forest section I think that this would have easily matched any day we had on the Dales Way and South Downs, had we walked in the original direction as we intended - From Guildford to Boxhill, the best part would have come towards the end and may have blanked out the bad parts.